WARM THANKS TO: Jarmo Huida, Esa Lagerlund, Heli Lampi, LVI-Halli Peltomäki, LVI-Mustaniemi, Ilmastointi Salminen, Annu Mikkonen, Markku Ollila, Pori Theatre, Pori Sinfonietta musicians, Porin PK-lämpö, Porin YH-asunnot, SataCom, Jaana Simula, Jan Söderblom, Tampere Conservatoire, Henri Terho. The opera Croak – Or The Unexpected Joys And Perils of Singing will premiere at Promenadi Hall in Pori on Friday 9th of March at 7 pm. The score of the opera was written by composers Maria Kallionpää and Markku Klami, and the Pori Sinfonietta orchestra will be led by conductor Nils Schweckendiek. All in all, five soloists, seven puppeteers and thirty puppets along with the Pori Opera Choir will take to the stage during the shows. Croak is a tragic musical fantasy about love, the gift of song, and about the responsibility brought on by talent. Mikhail Brashinsky’s libretto draws its inspiration from the wisdom of classic fairytales. Croak is directed by Anna Ivanova-Brashinskaya, who has worked extensively both as a director and a teacher to promote the art of puppeteering in Finland. The puppets, costumes and the set are designed by Viktor Antonov. 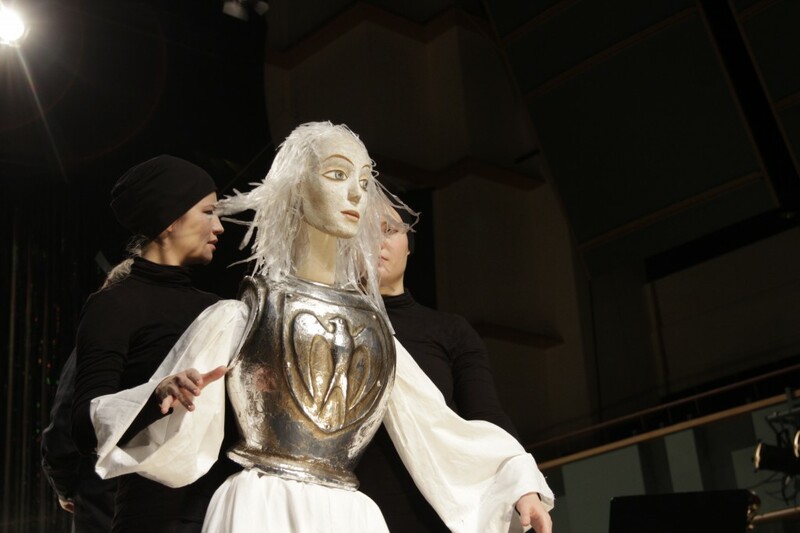 The composers Maria Kallionpää and Markku Klami, director Anna Ivanova-Brashinskaya and conductor Nils Schweckendiek were all intrigued by the many layers concealed within the realm of the puppet opera. When working on the score, the composers considered the unique voice qualities of all the soloist, and the musical landscape and the set visuals were created in close interaction with all the artists. In the rehearsals earlier this year, there was a palpable spirit of enthusiasm and curiosity, which came in handy resolving the surprises of the cross-disciplinary collaboration. Croak is set to renew both the opera tradition and the art of puppeteering. The music, the visuals and the choreography have all been made for a contemporary audience. The dialogue between the art forms brings fresh and expressive perspective to the ancient theme of longing for love. The Croak soloists are soprano Anna-Kristiina Kaappola, tenor Joonas Eloranta, countertenor Teppo Lampela, mezzosoprano Merja Mäkelä, and bass-baritone Jouni Kokora. The puppeteers on stage are Johanna Kultala, Maria-Elina Koivula, Anna Nekrassova, Jenni Rutanen, Riina Tikkanen, Lotta Virtanen, and Paula Vilmi. The assistant diretor is Roosa Halme, and the opera was choreographed by Tatiana Gordeeva. The rehearsals of the Pori Opera Choir were led by Ognian Vassilev. The Croak Opera is produced in cooperation with the Pori Opera and the Mixed-Art Association Poike, with Heli Latvala and Tuuli Penttinen-Lampisuo as executive producers. Press images for professional use here. Olivia’s Aria by Maria Kallionpää was premiered at the Pori Opera Gala on the 25th Nov. 2016 by sopran Anna-Kristiina Kaappola and Pori Sinfonietta. Olivia Puppet by Viktor Antonov, puppeteers Anna Nekrassova & Jenni Rutanen. 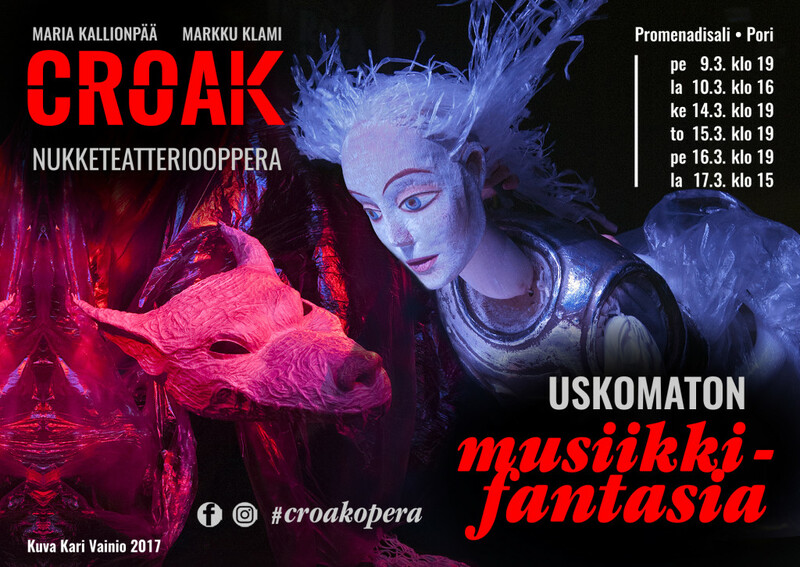 The large-scale puppet theatre opera Croak, composed by Maria Kallionpää & Markku Klami, will premiere on the 9th March 2018. The first ever large-scale puppet theatre opera in the Nordic Countries will be conducted by Nils Schweckendiek. The central roles in the cast and production team of the Croak Puppet Opera have now been confirmed. Soprano Anna-Kristiina Kaappola will interpret the voice of the heroine Olivia, and tenor Joonas Eloranta has been cast as Lord Croak. Pori Sinfonietta will be led by conductor Nils Schweckendiek. A group of puppeteers from the Aura of Puppets Network will bring the puppets alive on the stage. All in all, there are approximately 100 people involved in the making of the Croak Puppet Theatre Opera. Conductor Nils Schweckendiek (born 1978) has studied music at the Cambridge University and at the University of Music in Freiburg, Germany, and obtained an MA in Music at the Sibelius Academy in Helsinki. Schweckendiek has worked extensively with both new music and opera, and conducted the Ulm Opera in Germany, as well as many works of opera in various countries. At the moment, he is the professor of Choral Conducting at the Helsinki University of Arts and the Artistic Director of both the Helsinki Chamber Choir and the International Einojuhani Rautavaara Composing Competition. The Devil’s voice in the Croak Opera will be sung by countertenor Teppo Lampela (born 1969). The tenor Joonas Eloranta (born 1976) is the conflict-torn Lord Croak who is challenged by the heroine Olivia through the voice of soprano Anna-Kristiina Kaappola (born 1965). The voices of the Prince Couple – in other words Olivia’s parents – are sung by mezzosoprano Merja Mäkelä and bass baritone Jouni Kokora (born 1969). The different characters in the opera will be portrayed by human-size puppets brought alive by puppeteers Jenni Rutanen (born 1982), Johanna Kultala (born 1984), Maria-Elina Koivula (born 1983), Anna Nekrassova (born 1989), Lotta Virtanen (born 1984), Riina Tikkanen (born 1988) and Paula Vilmi (born 1984). They have all graduated from the Turku Academy of Arts and work both in Finland and internationally in various projects as performers, directors, puppet and mask makers, as well as teachers. The Croak score is composed by Maria Kallionpää (born 1981) and Markku Klami (born 1979) and the opera is directed by Anna Ivanova-Brashinskaya (born 1964). The libretto was written by Mikhail Brashinsky (born 1965). The puppets are designed and made by Viktor Antonov (born 1961). Lighting Designer Iana Boitcova (born 1985) and choreographer Tatiana Gordeeva (born 1972) will both contribute the stage visuals. The project was initiated by puppeteer and composer Roosa Halme (born 1982), and in addition she will assume the assistant director’s duties. The Croak Opera is produced in cooperation with the Pori Opera and the Mixed-Art Association Poike, with Heli Latvala (born 1950) and Tuuli Penttinen-Lampisuo (born 1969) as executive producers. Conductor Nils Schweckendiek has began the rehearsals with the Croak opera soloists in November 2017. Photo: Marco Borggreve. The first full-length puppet opera produced in the Nordic Countries will be composed by Maria Kallionpää and Markku Klami. “We are inspired by how contemporary puppet theatre, visuals and music are intertwined in CROAK in an unforeseen way and create a resounding, complete work of art. The different vocal attributes will play a significant role within the music, as tonal variations underline the libretto’s timeless message – the desire to be loved,” say the composers. The opera is titled CROAK or The Unexpected Joys and Perils of Singing, and it will premiere in 2018 at the Promenadi Hall in Pori, Finland. Composer and pianist Maria Kallionpää (b. 1981 in Ulvila) is best described as a pan-European and interdisciplinary artist and academic. In 2015, she defended her PhD thesis on extended playing techniques in contemporary piano music at the Oxford University. At the moment, she is composing for the Teatro Dell’Opera di Roma and is a visiting researcher at the University of Aalborg, Denmark. The works of Markku Klami (b. 1979 in Turku) have been performed at various international festivals worldwide. His catalogue consists of chorus and orchestra pieces and chamber opera. Klami graduated from the Turku Arts Academy in 2006 and completed his Master’s Degree in Music at the Sibelius Academy in Helsinki in 2010. The libretto of the puppet opera CROAK is written by film director and screenwriter Mikhail Brashinsky (b. 1965 in Leningrad). In the libretto, the emotions of the protagonist Lord Croak are torn between love and death, as his fate is to succumb to the price he must pay for his magical gift of song. CROAK is dedicated to the memory of composer Jouni Kaipainen (1956–2015). The puppet opera project started three years ago with a call for submissions for five Finnish composers, out of whom Jouni Kaipainen was selected to compose the opera. Kallionpää and Klami also participated in the call for submissions. Jouni Kaipainen passed away unexpectedly in November 2015. He was still working on the composition when its initial working title Halewyn was changed to CROAK. Now the new composers are given the chance to start anew and finish their original composition with plenty of time. CROAK will premiere at Promenadi Hall in Pori in 2018. CROAK will be directed by puppet theatre artist Anna Ivanova-Brashinskaya (b. 1965 in Leningrad). Her assistant director is Roosa Halme (b. 1982 in Littoinen) who initiated the production of the puppet opera when working as a regional artist in the Pori office of the Arts Promotion Centre Finland. 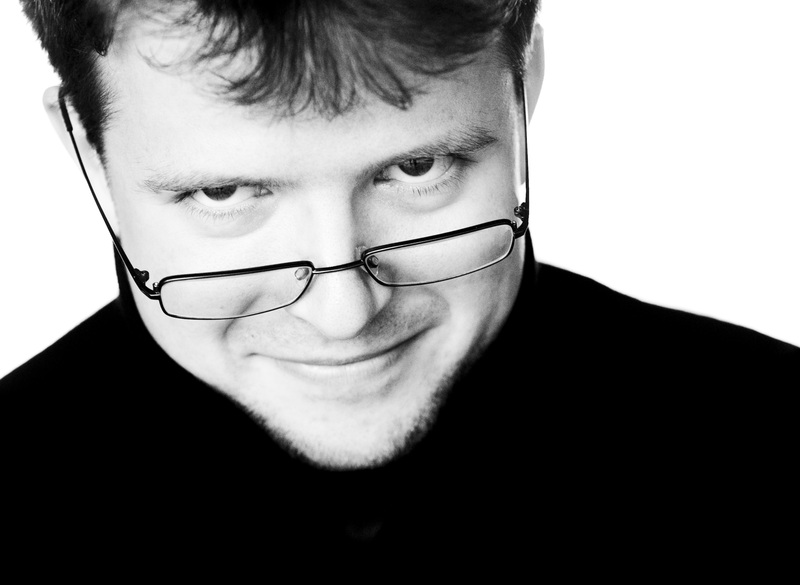 The opera visuals and puppets will be designed by Viktor Antonov (b. 1961 in Leningrad), and the project will be realized in co-operation with the Turku-based puppet theatre association TIP-Connection. CROAK’s score will be played by Pori Sinfonietta conducted by Jan Söderblom (b. 1970 in Helsinki). CROAK is produced in co-operation between Pori Opera and Mixed-Art Association Poike, with Heli Latvala (b. 1950 in Pori) and Tuuli Penttinen-Lampisuo (b. 1969 in Tampere) as executive producers. The puppet opera CROAK has been sponsored by the Swedish Cultural Foundation in Pori, the Satakunta Regional Fund of the Finnish Cultural Foundation, the Ministry of Education and Culture, and the Arts Promotion Centre Finland. Sketches for the puppet theatre opera by Viktor Antonov. On 23rd Nov. 2015 we got sad news. 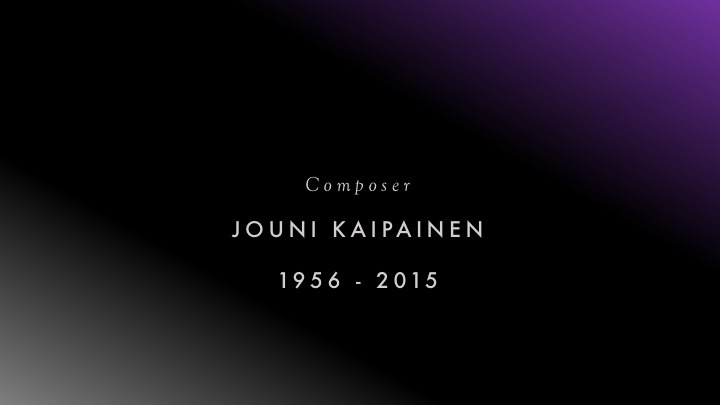 Our great composer and colleague Jouni Kaipainen died at the age of 58. Long live his music. 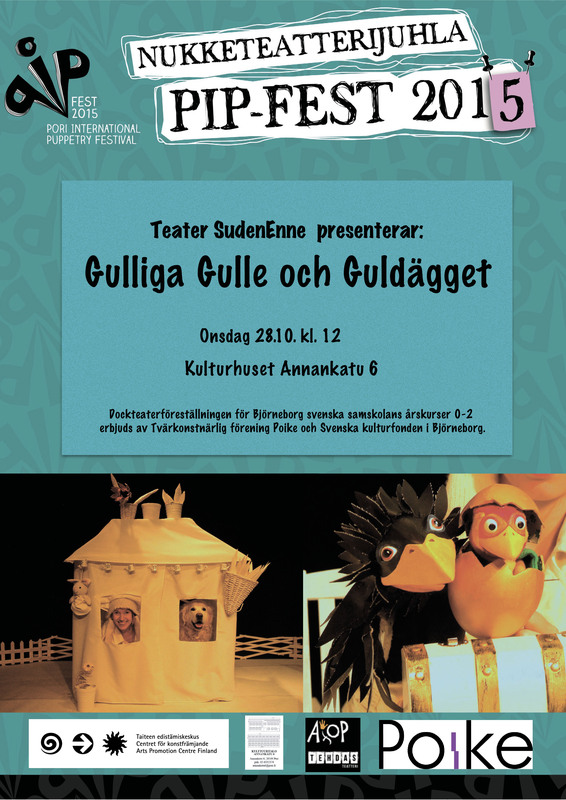 Theatre SudenEnne visited Pori in October 2015 with its marvellous puppet and dog theatre performance! 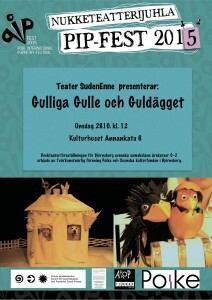 At 12 a.m. Gulliga Gulle och Guldägget – played in Swedish, produced by Poike and supported by the Swedish Cultural Foundation in Pori. At 6 p.m. Kulta Noutavainen ja kumman kiukkuinen siivekäs – played in Finnish. SEMINAR Fri 14th Nov. 11am – 4pm. Auditorium, 4rd Floor. Free entry. 13:20 Break about 20 mins. Café is open at the 2nd floor. 13:45 Super Instruments? Extending the Instrumental Capacities. – Superinstrumentteja? Laajennetut sointiratkaisut by Composer & Pianist – Säveltäjä ja pianisti Maria Kallionpää (in Finnish). 15:50 Closure by Roosa Halme. Valimo Hall, behind the Conservatoire main building. Tickets: 5e, Family ticket 15e. The Concert lasts appr. 1,5 hours. We have an open Q&A session after the concert. Production: Nukkero / PIP-fest in cooperation with The Embassy of the Republic of Indonesia in Helsinki. Sat 15th Nov. 11am – 2pm at Palmgren Hall 2nd Floor and Sun 16th Nov. 12am – 3pm at Valimo Hall (entrance behind the main building). La 15.11 kello 11 – 14 Palmgren-salissa 2.krs ja su 16.11. kello 12-15 Valimo-salissa (käynti Valimoon päärakennuksen takaa). Leaders Anna Ivanova-Brashinskaya and Roosa Halme. Ask access for spectatorship! – Kuunteluoppilaspaikkoja voi tiedustella tuottajalta! SCHOOL VISIT to Svenska Samskolan i Björneborg – Swedish School in Pori by Thomas Lundqvist on Fri 14th Nov.
MASTER CLASS LECTURE to Palmgren Conservatoire music technology students by Maria Kallionpää on Thu 13th Nov.
Puppet Theatre Opera Symposium is an educational programme as part of the Puppet Theatre Opera Project. Puppet Theatre Opera Project is co-produced by Poike, Pori Opera, Pori Sinfonietta and T.I.P.-Connection with the support of Pori Branch of the Arts Promotion Centre Finland, Ministry of Culture and Education, Finnish Cultural Foundation’s Satakunta Regional Fund and the Swedish Culture Foundation in Pori. Also Regional Puppetry Association Nukkero takes part in the project. Thank you for the educational cooperation to Palmgren Conservatoire and Svenska Samskolan i Björneborg – The Swedish School in Pori!